2.5also pumps out the torque for brutal, wheel-standing launches and absolutely ruthless acceleration. The sleek body design cheats the wind with its smooth curves and low-slung stance, while the outrageous graphics dominate with style. The separate wing securely bolts to the body with precise aluminum hex hardware. Chrome 2.8 Twin Spoke™ rims are wrapped with pre-glued Alias™ step-pin tires in the rear and Alias™ ribbed tires up front. The high-tech rubber compound ensures great grip on a variety of surfaces. Grey-molded composite parts are thoughtfully integrated to enhance the look of the chassis. 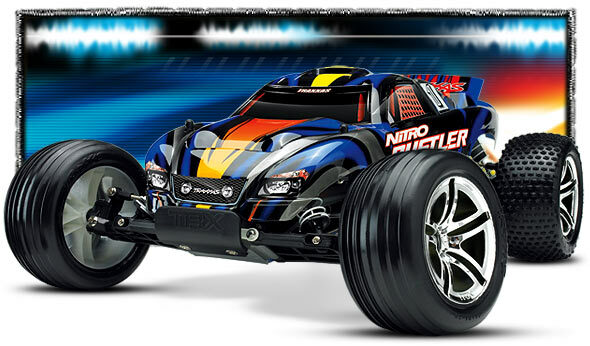 Fast, light, and loaded with power, Nitro Rustler's power-sliding, dirt roosting attitude will have you reaching for the throttle again and again. Front Tires­ Alias™ Ribbed 2.8"
Tires Pro-Trax 2.2" Alias 2.8"
Traxxas Top Fuel 20% Quart Duratrax 19-in-1 Tool Set w/Pouch For Traxxas Traxxas Body Clips (12) Pro-Line M2 Trencher 2.8"